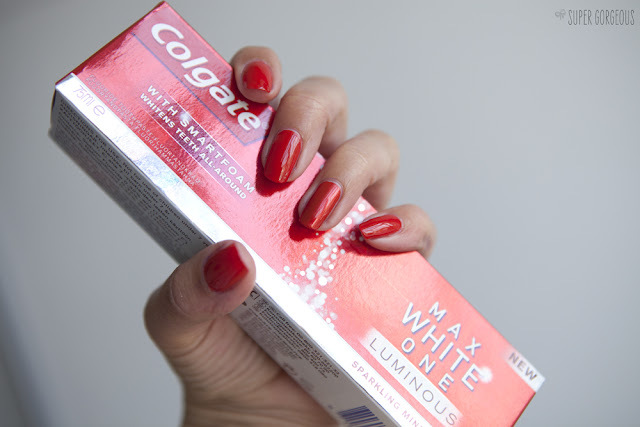 Colgate has teamed up with Nails Inc to create two exclusive shades of nail polish - Luminous Red Gloss, and Luminous Red Metallic - limited edition shades which are FREE when you purchase the new Colgate MaxWhite ONE Luminous toothpaste from Boots. Colgate MaxWhite ONE Luminous contains new SmartFoam technology which bursts foam in your mouth - enabling even between your teeth to get clean and white. It contains White Accelerator microcrystals which release ingredients similar to those used by your dentists as you brush. Colgate claim that by using this toothpaste, your smile will be one shade whiter in just one week! It seems a great deal that you are getting not only this fab sounding toothpaste, but a full sized nails inc polish for only £3.99. There are two shades to choose from - Luminous Red Gloss, and Luminous Red Metallic. 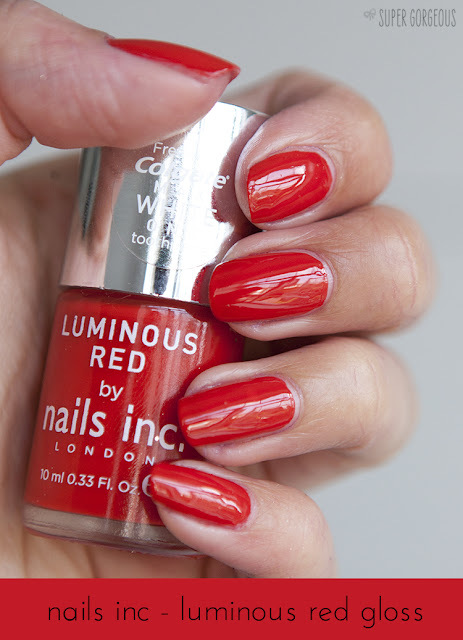 Luminous Red Gloss is a gorgeously glossy post-box red - Luminous Red Gloss, it's metallic sister - exactly the same shade, but with a metallic finish to the polish. I found it really easy to apply - maybe it's because I've been dabbling in textured polish recently, but it went on like a dream! These are only available while stocks last - so go go go! Good luck! I just popped in Boots and saw this offer and I'm on the fence about whether I need another red nail polish but then for the price of a tube of toothpaste I don't know why I'm resisting!! I dont live near Boots... argghhhh!!!! I get this toothpaste on a regular basis, so it's nice to see some freebies with it!